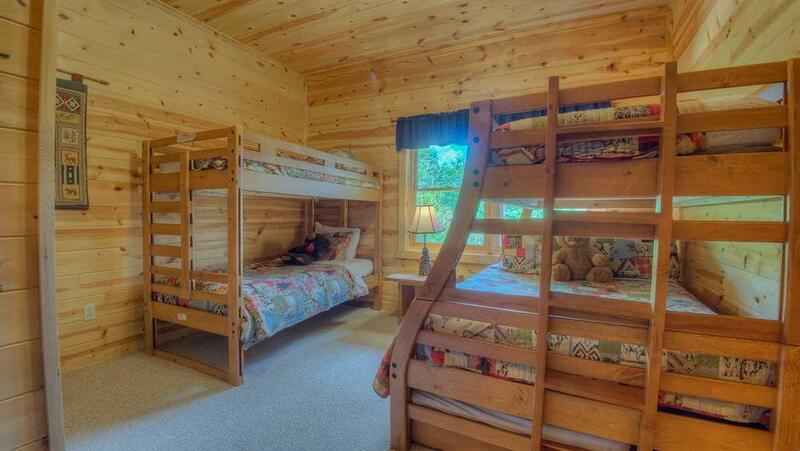 Three Little Bears feels like a true home away from home among North Georgia cabin rentals. 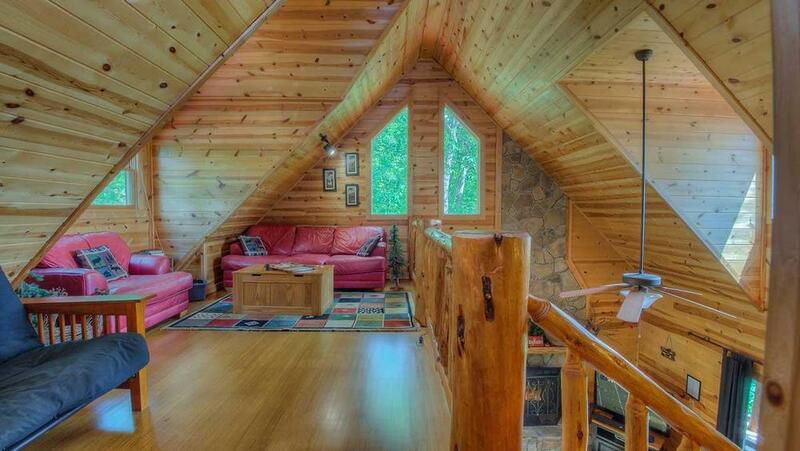 If this were the cabin in Goldilocks and the Three Bears, it would be described as 'just right.' Its picture perfect entrance welcomes you into an inviting family room with vaulted ceilings and a wood-burning fireplace reaching two stories high. You'll spot homages to bears throughout the home, along with nature-themed accents like acorn ornaments, leafy rugs or lamps made of antlers, a large pinecone or tree bark. There are so many ways to enjoy your time here. You may want to sink into the sumptuous sofas, flip on the TV and spend the rest of the afternoon watching a movie. If you're seeking a little quiet time to yourself, the large loft overlooking the family room is a great place to curl up with a book on comfy, contemporary furniture nestled among the charming dormer windows. Outside, indulge in a peaceful afternoon in the hammock, napping or flipping through a magazine. 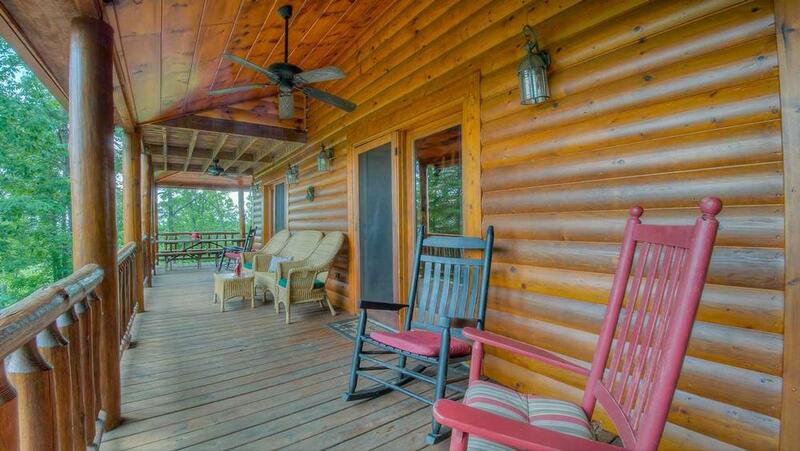 Or simply bear witness to breathtaking mountain views from the comfort of the deck's four rocking chairs or the loveseat glider. 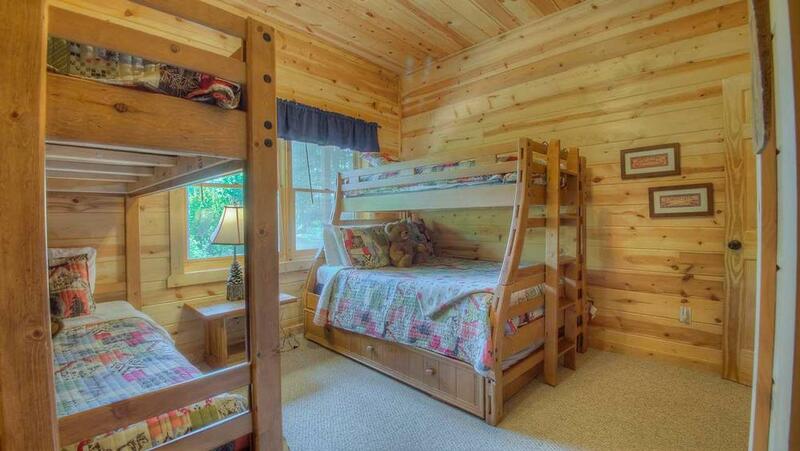 Named for the cabin owners' three children, Three Little Bears was built with family in mind. The 'cubs' will have a blast in the game room, playing air hockey, foosball, PlayStation 2, Nintendo Wii, and board games. There's even a poker set for grown ups. Kids of all ages will be excited to get their 'paws' on the swing set outside. 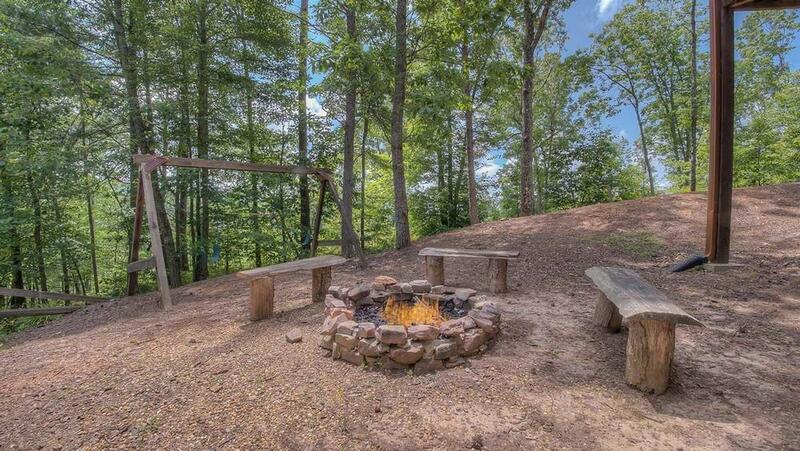 And the fun doesn't end when the sun goes down — get a fire going in the fire pit so the gang can make s'mores and watch for shooting stars. 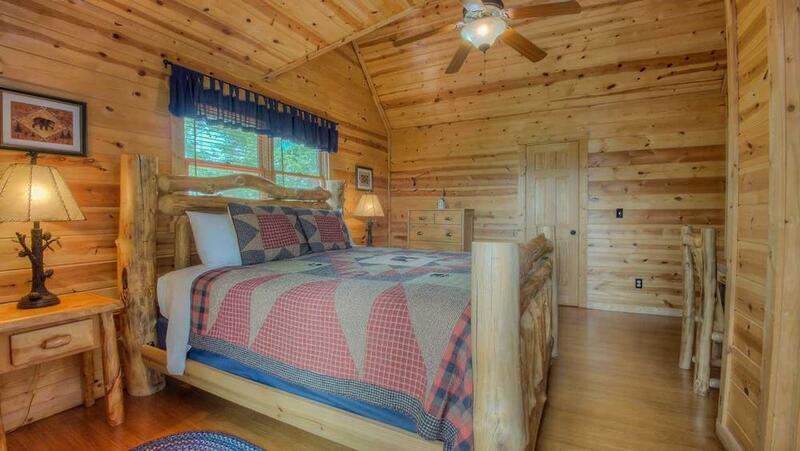 When you're ready to hibernate, look no further than three welcoming bedrooms. 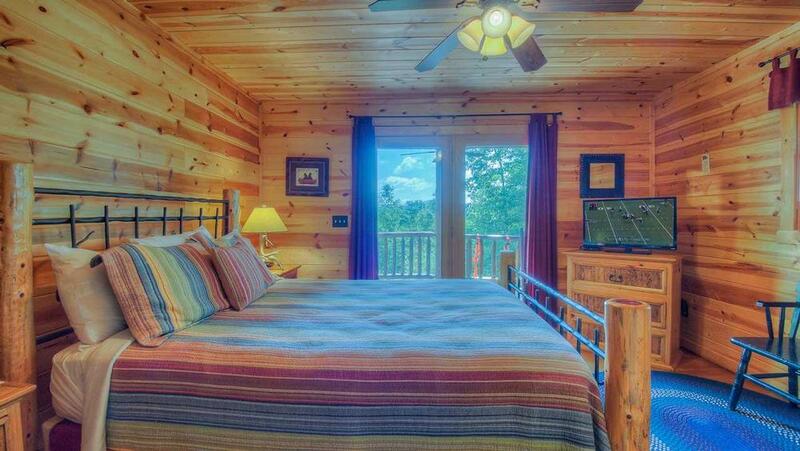 The beautiful king master bedroom suite upstairs has its own balcony overlooking the valley. On the main floor, the warm and inviting queen bedroom suite opens out to the wraparound deck. Step out from either bedroom to start the day watching a spectacular sunrise. There's also a bunk house downstairs with twin over full bunk beds and twin bunk beds with trundle, so plenty of room for the kids. 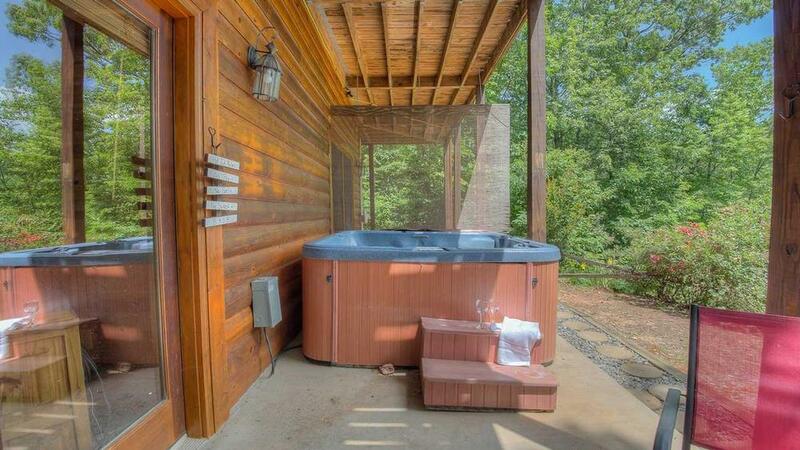 Once they're tucked into bed, indulge in a romantic, moonlit dip in the roomy hot tub with your honey. What a sweet way to end the day. 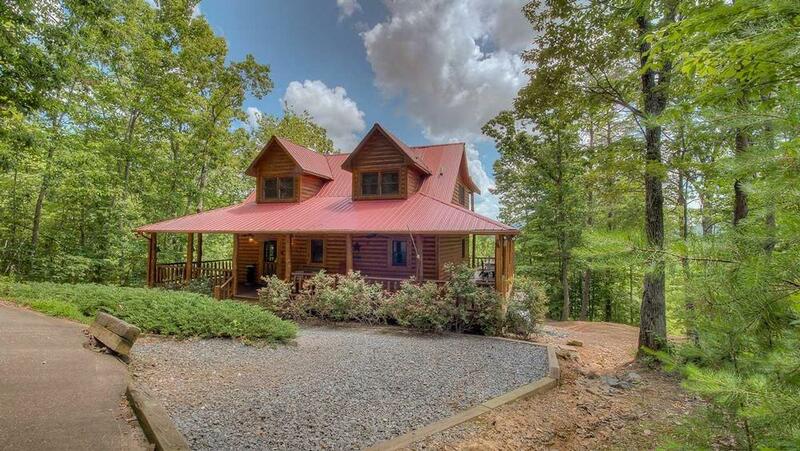 Three Little Bears is a place to get away and spend quality time with family doing activities together here in the cabin or taking a short drive to check out all the adventures the North Georgia mountains have to offer. As the sign says that adorns the family room, 'It's A Wonderful Life.' Here, it's all about bringing that phrase to life for you and your family. Driveway - paved driveway, ample parking but road does have a section of gravel that is steep and requires four wheel or front wheel drive. 03/19 - The home was very comfortable and cozy. The company is very attentive and accommodating and well priced. 01/19 - This was our 2nd time at this cabin. We love the view, and the space. 4th or 5th year with Escape to Blue Ridge! We will be back next year! 10/18 - The house was very clean and well-maintained. We also loved all the amenities...the fire pit, the hot tub, the games, the swing set! Everything was so wonderful! The company was very easy to deal with, and I loved all the special touches like the welcome gift and toiletries. We will definitely consider renting from you again! 10/18 - Breathtaking views of the mountains. 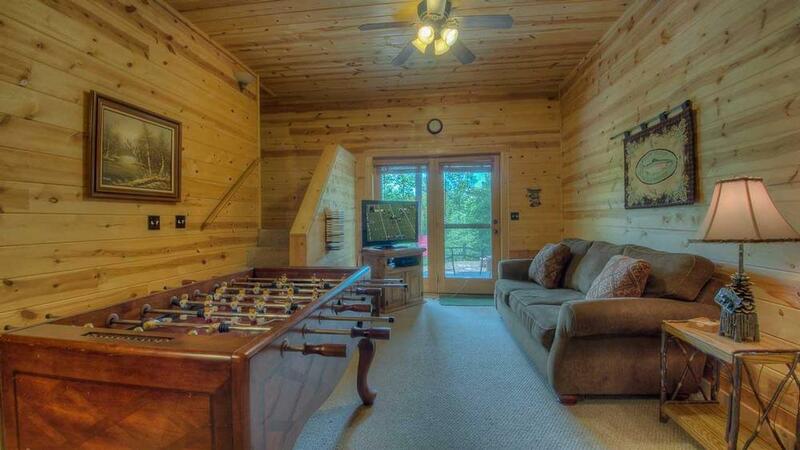 The cabin had games, foosball and air hockey that kept my four kids entertained for hours! The cabin was beautiful and had plenty of room for our family of six.The representatives at Escape to Blue Ridge were kind, friendly and courteous. They provided detailed information, followed up with emails. 06/18 - The view was nice and the kitchen was well stocked with dishes. 08/17- I loved the floor plan, it worked very well for my family. A highlight was playing air hockey with my grandson. There were books galore and a lot of games. Never a dull moment. The website was fairly easy to navigate though sometimes I felt like I had to back track to match up cabins and availability. I spoke to four or five staff members and each was super friendly. They offered ideas for things to do and asked if I had any questions. 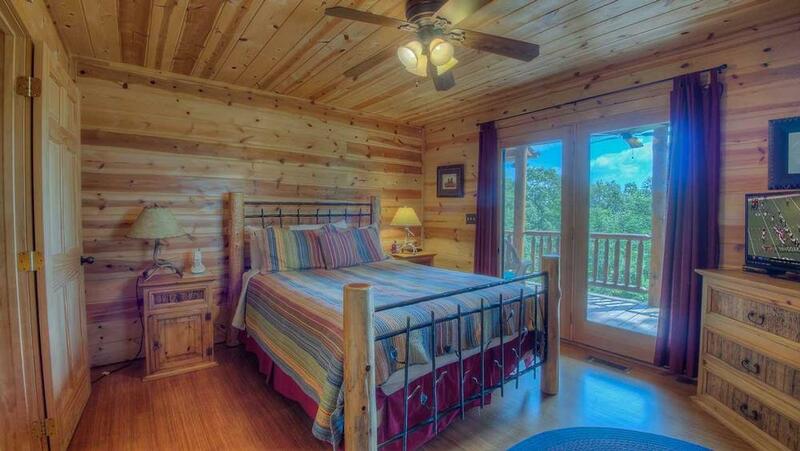 Looking forward to our stay in Cherokee Ridge in October!! 04/17- I liked the location and the style of the cabin. The staff were very helpful and nice every time I talked to them. 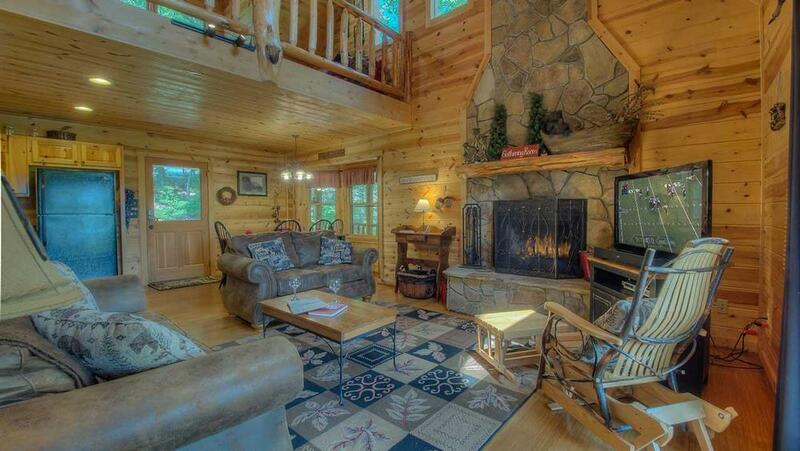 03/17- Our favorite features of the home were the location and quality of the cabin. Really great experence. 02/17- The master bedroom view was our favorite feature of the cabin. 01/17- Very relaxing and beautiful decor. Amazing friendly experience. Everyone I have spoken to couldn't have been nicer to deal with and we are thankful for such great memories of our honeymoon. 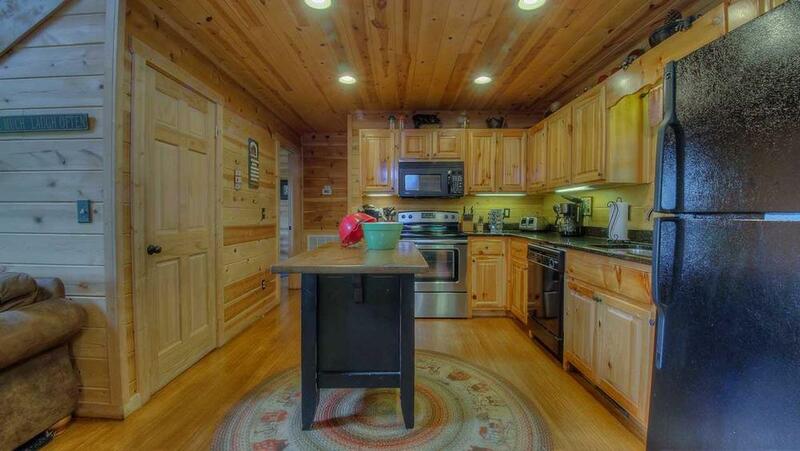 01/17- Beautiful cabin, well equipped kitchen, you don't need to leave the cabin. Great play area for everybody. The kids enjoyed playing air hockey and running outside. Great staff. 11/16- No 1 thing was better than the other...it was all great. 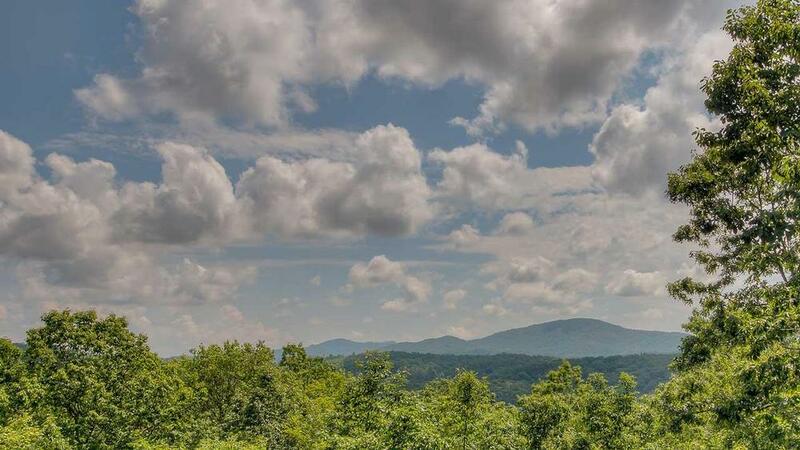 Escape to Blue Ridge is more than amazing! 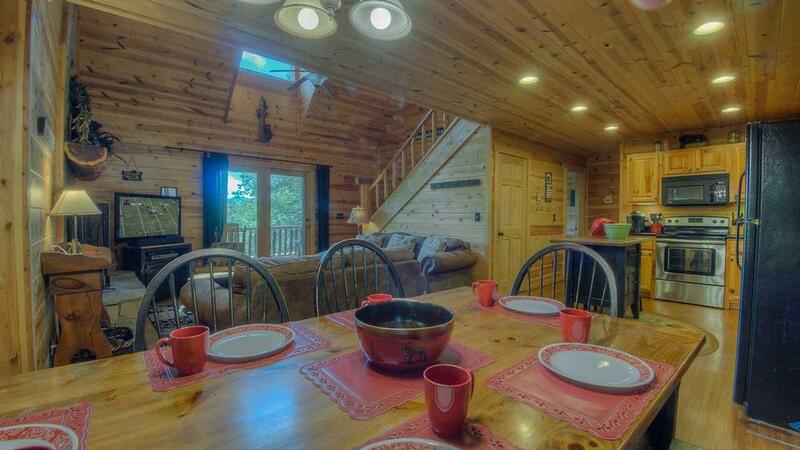 10/16- The cabin was easy to find, well equipped and in a great location with a beautiful setting. Comfortable house. Clearly well maintained and well-loved. At first, I was not pleased to learn about the $23 service charge, however because I have previously rented my own house on the beach, I think the charge was reasonable in providing linens, covering charge card fees, and initial supplies. Pleased with the communications and services of the company. 10/16- The three separate floors for bedrooms and three separate bathrooms per floor was a great feature. The cabin was most comfortable and enjoyable. I will use your service again. 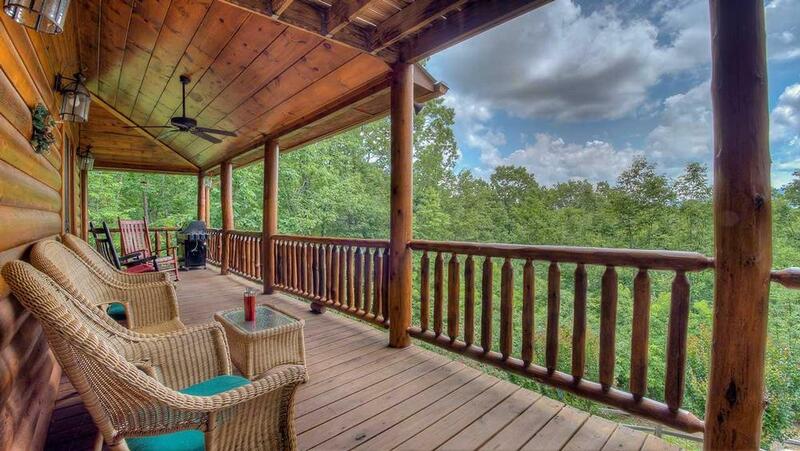 10/16- Very nice view, big back porch! Very professional company. 08/16- Great view from the upstairs balcony. Thank you for such an amazing setting for our memories. Phones were answered promptly, and if it was after hours, someone called back immediately, you were very gracious in last minute changes to our head count and gave a prompt refund. 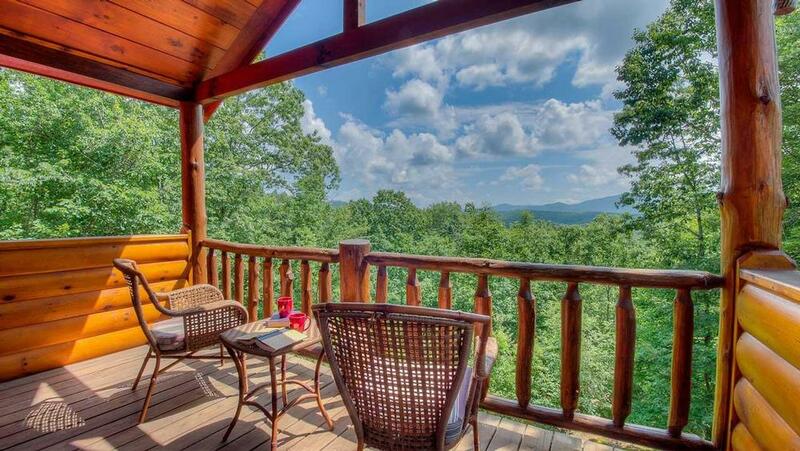 I would recommend Escape To Blue Ridge to my family and friends looking for a well kept, clean rental. 4) the game room - air hockey and Legoes were tops along with the other toys provided....exceptional planning for children! 10) firewood to use in the firepit- that was enjoyed by all, especially in making s'mores! Our grandchildren ate and laughed and had a fun time roasting marshmellows. 14) the firepit- relxing and calming as we enjoyed chatting around it, watching the flames flicker, roasting marshmellows, and making s'mores. 15) the loft- futton, large sofa, chair, and more Legoes and toys....perfect setting! Our grandchildren loved playing in this area...and we did too (as well as i nthe gameroom with air hockey!! 16) appliances- large and small, pots and pans, cooking utensils, plates, bowls,everything we needed was practically available for us....amazing! 19) the balcony sitting area on the top floor- perfect and breathtaking as well. Our oldest daughter and her husband will be celebrating their 10th wedding anniversary next week and she brought her wedding dress and camera. I took pictures for her as she held a small sign stating: "Ten Years Later". She looked so beautiful, just as she did 10 years ago when they were married in the church. People thought a professional took them and loved the idea of taking pictures at your place! 20) the washer and dryer came in handy for washing our grandchildren's clothes....nice! 21) the grill- great for steaks Saturday night! 22) the sweet way the company worked with my husband as he planned our stay there. The people he talked with throughout the preparations and us arriving there a tad early were exceptionally kind, helpful, and sweet. It was a very, very wonderful experience indeed!! 04/16- There was not one thing in this home that was not a great asset . We had five children with us on this stay and they never once said IM BORED !! The playroom and toys kept them busy. 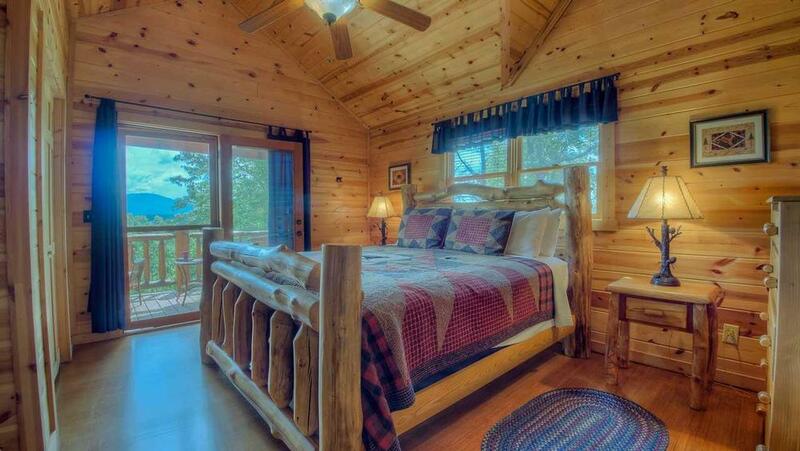 We loves absolutely everything this cabin offered. From start to finish it was a great experience. Anytime I called and spoke with anyone I always received very helpful information. When we decided to book our cabin they made sure we knew we knew to have a four wheel drive or front wheel drive vehicle so we could reach our cabin without any issues. This was the best experience from top to bottom that I have ever had. 04/16- The location was great - not too far from BlueRidge but not in town. The decor was cute and comfortable. The porch was lovely. Swings and Hammock an extra pleasure! Having the simple toys was great for little kids! We had a great outdoor fire for our somemores! 03/16- The country vacation feel to it and all of the amenities of home. The kids absolutely loved the game room - it would not have been the same without that. We all loved that we had internet which also would have been a deal breaker had we not had that. 03/16- This Cabin was beautiful and had enough space for our family of six! My 10 and 8 years had their own space in the game room and just had an amazing time. The fire pit was one of my family favorite things to do while in the cabin. 03/16- The air hockey table. The fire pit. 02/16- Cabin was exactly as advertised. Very cozy and nice tvs in all rooms. Nice staff - easy interactions. Liked using code to get in cabin instead of having to stop at an office. 01/16- The home was absolutely gorgeous! It was definitely kid friendly, as this was a big deal since we brought our 3 children with us. Baby gates were in the closets, booster seats, toys, anything that you could think of, they had it ready there for you to use.The company was very nice and helpful. Was a pleasure making reservations with them! 11/15- My family and I loved the Air Hockey table the best. The solitude feel was great for us as well. We didn't have to worry that we (our Dogs) would bother anyone. It was decorated very nice and comfortably. You are were great to work with. Any questions I had you never seemed annoyed with. 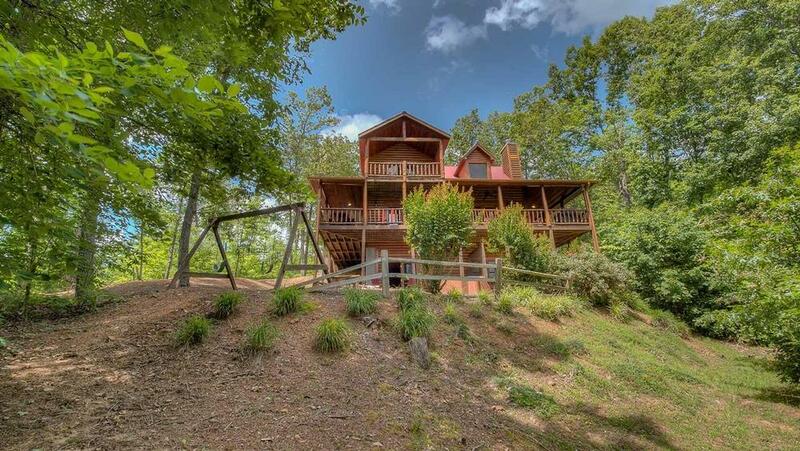 11/15- Cabin is perched on a hill, away from other cabins, and has impressive mountain views from two sides. Balconies are really beautiful, and offer panoramic views on both main and upper floors. 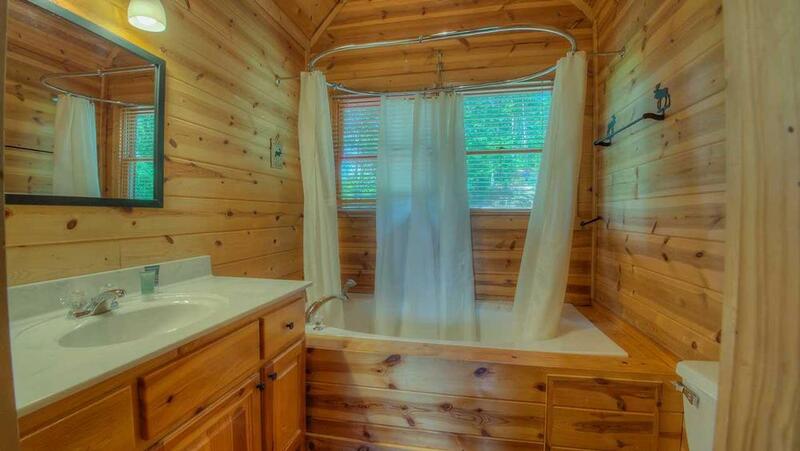 Master bedroom and bath are very attractive, spacious, and comfortable. Game room and living area on lower floor is well-equipped, and great for kids. Nicely decorated and very comfortable. 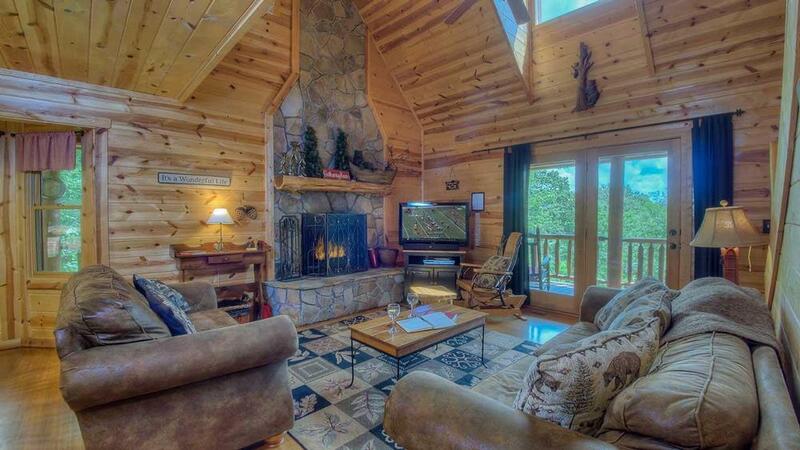 11/15- The cabin was really cozy. We slept with the windows opened and enjoyed the crickets sing. 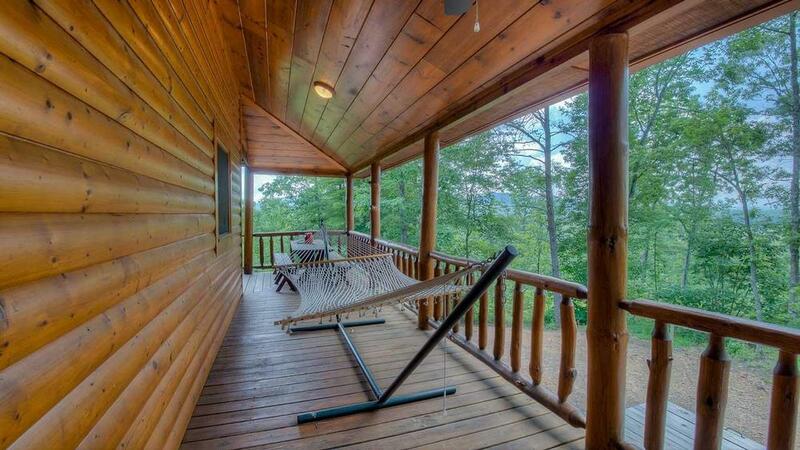 Loved the hammock and the wrap around porch. Plenty of outdoor seating. Very easy to speak with and make our last minute reservations. When we arrived we realized there was no firewood. Called upon arrival and someone delivered a whole rack of wood the next day...awesome customer service. 06/15- We enjoyed how cozy and kid friendly it is. 06/15- The view was amazing! Deck was fabulous! We enjoyed the fire pit. The company is wonderful and very easy to use. 05/15- There were many! Nicely appointed, entertainment for all, easily accessible with the door code vs checking into an office, clean, & many conveniences to help make a visit more enjoyable. 12/14- The fire place, wrap around deck, and deck off the master bedroom were all loved. 12/14- The view, the playset, and attention to detail for the kids were great! Seemed to be very professional. I had the host person call me back within 1 hour to help me figure out how to use the air hockey machine. I like the ease of check in...much nicer to just go straight to the cabin then having to go to a check in facility first!!! 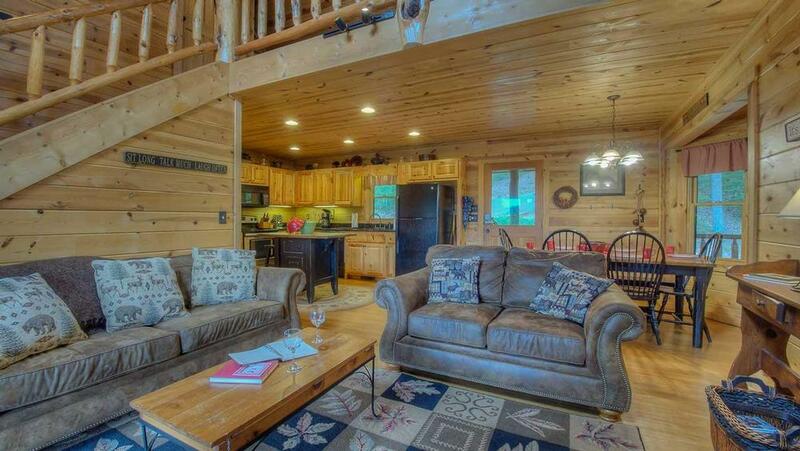 We fell in love with the Three Little Bears cabin! We had 8 people and a dog and there was plenty of room for everyone. 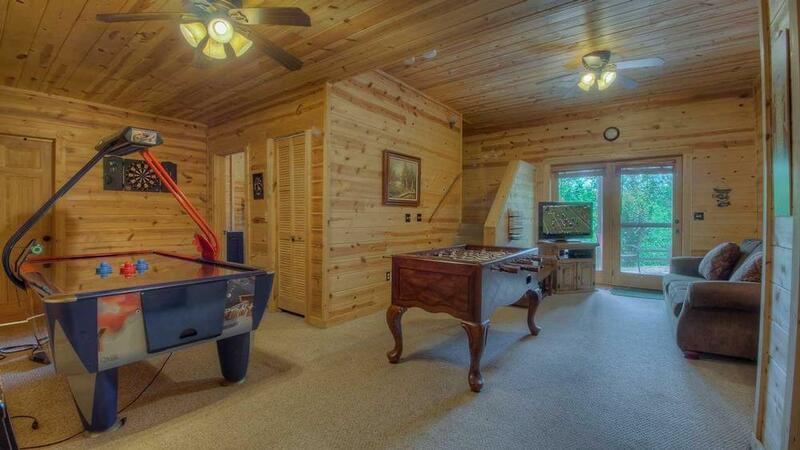 The air hockey and Foosball tables were a big hit with the kids (and the adults) and the deck, which wraps around the entire cabin, handled endless bags tournaments. The view is beautiful as well! 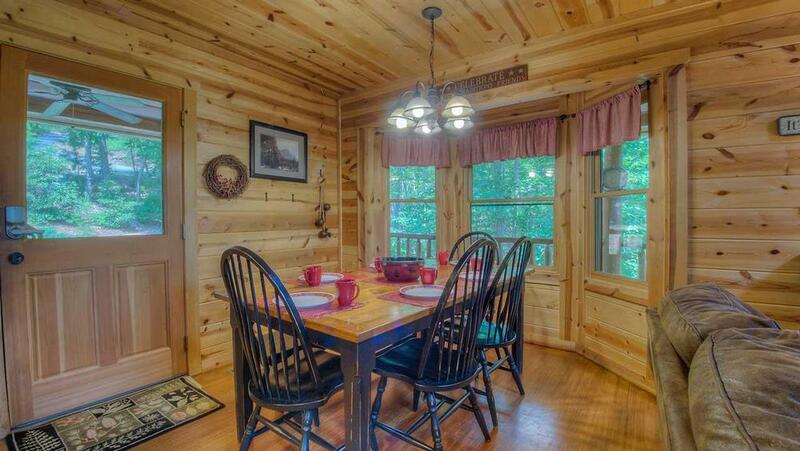 We would love to come back to this lovely cabin again, perhaps in the fall. The EBR staff was very friendly, informative and helpful, and promptly returned all calls. We did have a minor problem with the water pressure during our stay and that was taken care of immediately. We were very happy with our cabin and how everything was handled.